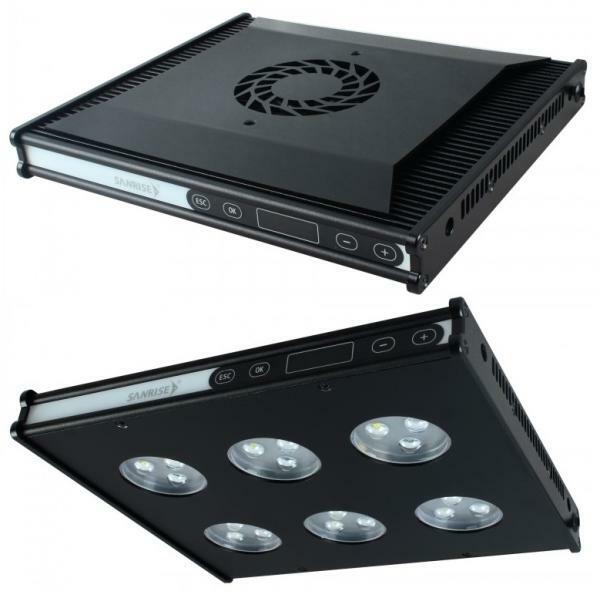 Aqua Sanrise Plus 30 is a professional 18 LED aquarium light which includes WiFi smart control, intelligent temperature control, DIY lens and LED replacement capability. Manual touch control and 6 channel full WiFi control of sunrise to sunset timer programs x 3, lightning and clouds, colour and intensity via IOS & Android devices. Supplied with 3 in 1, 120 degree optical lenses for wide light spread. Optional 90 degree lenses available for narrower/deeper light spread. Power supply: Input:100-240v AC/ Output: 23.6v. IP20 Indoor use.